Regional gains from conventional growth-based development practices remain insufficient and unequally distributed throughout much of Central Appalachia. The legacy of absentee landownership, low wages, out-migration, and economic development policy failures, coupled with new challenges presented by forest fragmentation, exotic invasive species, and climate change, offers little hope for individuals seeking to improve their quality of life. Since the mid-twentieth century, Central Appalachia has suffered from economic decline as a result of decreases in employment in extractive industries. As resource extraction declined and jobs were lost, many individuals emigrated from the region. Those that chose to remain have often turned to alternative economic practices, such as handicraft production, to make a living. Thus, the recognition and advocacy of alternative economic practices in rural areas may offer communities new development possibilities. Such new development possibilities must however, be analyzed both economically and ecologically. While organizations may financially support handicraft production, this is not enough to guarantee the sustainability of the handicraft industry. The raw materials handicraft producers’ use, such as hardwood trees (e.g., oak, walnut, ash), often face threats from insect pests and pathogens that affect resource quality and quantity. In this essay, the authors examine the significance of the handicraft industry as an alternative to failed conventional economic development strategies in Central Appalachia and explore ecological threats facing handicraft producers in this geographic region, focusing primarily on examples of threats to hardwoods. The authors hope to generate awareness of and to call attention to the need to bridge the gap between economic and ecological discussions pertaining to alternative development strategies in economically depressed rural regions such as Central Appalachia. As employment in extractive industries continues to decrease and jobs have been lost throughout Central Appalachia, individuals have often turned to diverse economic practices such as small-scale agriculture and handicraft production to make ends meet (Mencken and Maggard 1997; Oberhauser 2002, 2005; Fickey 2011a). Such practices however, are not new. Woodland agricultural methods prevalent among Native American tribes and early European settlers were comprised of numerous diverse economic activities (Eller 1982, 2008; Williams 2002). Although such activities may have lessened with the rise of industrialization and wage-labor throughout the region, small-scale handicraft and agricultural production has persisted overtime and continues today (Fickey 2011a, 2011b). Such small-scale practices can be critical to sustaining livelihoods in rural regions with declining resource-based extraction industries (Oberhauser 2005; Carnegie 2008; Pretes and Gibson 2008; Fickey 2011a). For individuals who are no longer employed in mining and timber industries, who rely on state assistance for survival (as a result of injury, Black Lung disease, or retirement), the handicraft industry may serve a last resort that provides the cash needed to make ends meet without becoming disqualified for state programs. And yet, such economic activities are rarely understood as ‘development worthy’ in Appalachia and beyond (Gibson-Graham 1996, 2006; Carnegie 2008; Fickey 2011a, 2011b). Much work remains in the field of Appalachian Studies with regard to the documentation and fostering of alternative economic practices. These small-scale practices however, are not simply ‘alternative’ in that, the handicraft industry and its producers are themselves quite diverse (see Fuller and Jonas 2003 for a discussion of degrees of alterity; Leyshon et al. 2003; Samers 2005). Craft producers may engage in handicraft production in opposition to capitalist wage labor, in substitution to capitalist forms of labor (such as employment in logging or mining) that is no longer available, or in addition to other forms of wage labor. Despite the dominance of neoliberal development strategies within the handicraft industry that promote self-sufficiency and entrepreneurialism, the state as well as regional entities, simultaneously supports self-sufficient entrepreneurs as well as more cooperative handicraft production and distribution (Fickey 2011a, 2011b). In Kentucky, the state has allocated large sums of funding to the Kentucky Craft Marketing Program since the early 1980s (Barker 1991). Such funding has allowed the state to create a geographical lore for handicraft items produced in Kentucky; a lore which entices consumers – at regional, national, and international scales – with promises of high-quality, authentic products. This geographical lore benefits both cooperative members and entrepreneurs alike. Other states throughout Central Appalachia and Appalachia more broadly, may not have state-supported programs. Western North Carolina, for instance, has been very successful with the Handmade in America program which is primarily regionally based. Funding at the regional or state scale however, may provide a somewhat more stable market for handicrafts, and yet, it does not protect the industry in terms of accessibility to raw materials needed for handicraft production. Financial support at the regional and state level does not necessarily guarantee the sustainability of the handicraft industry over time. Raw materials that crafters use to produce handicrafted products often face ecological threats which are rarely if ever recognized by arts-related organizations. For example, craft producers working with hardwoods are often unaware of the potential threats of invasive species. Instead, Artisans often recognize and capitalize on qualitative irregularities caused by native insects and pathogens in the form of burls and flag worms, which can provide intriguing irregularities in wood products which enhance product appeal. corner of the basket bottom indicate worm damage. Photo by A. Fickey. However, in recent decades entomologists as well as others have noted threats that originate from exotic invasive species, which disrupt ecosystem processes and threaten tree survival and resource sustainability. Non-native species, including plants, insects and diseases, that have expanded beyond the limits of their native range – often via human transportation – are labeled ‘invasive’ once they begin to cause economic and ecological harm (Lockwood et al. 2007). The following are several examples of invasive species that threaten hardwoods typically used by handicraft producers throughout Central Appalachia. These images, as well as the resource database included at the end of the article, are meant to provide assistance with the identification of invasive species. Contact information for regional, state, and national organizations that can assist with the management/eradication of invasive species has been included. Image 2 – Symptoms of Sudden Oak Death (Phytophthora ramorum). Location: United States. Photo by Bruce Moltzan, Missouri Department of Conservation, Bugwood.org. Oaks are a dominant component of mixed mesophytic forests of Appalachia, and are tremendously important both economically and ecologically. Forest management strategies over recent decades have favored rapidly growing, shade tolerant species, to the detriment of oaks. These management strategies, conjoined with forest fragmentation, climate change, endemic pests, and recent exotic introductions, have been coupled with an alarming decline in our oak component. For example, the exotic Asiatic oak weevil is an acorn feeder that directly impacts oak regeneration. Invasive defoliating gypsy moth caterpillars can cause extensive oak mortality with a concomitant shift in species composition away from the highly valued oaks, and more recently, the sudden oak death pathogen threatens the sustainability of our red oaks. The decline of oaks in our forest will affect existing ecological interactions and economic practices, ultimately impacting the availability of this resource for the handicraft industry. 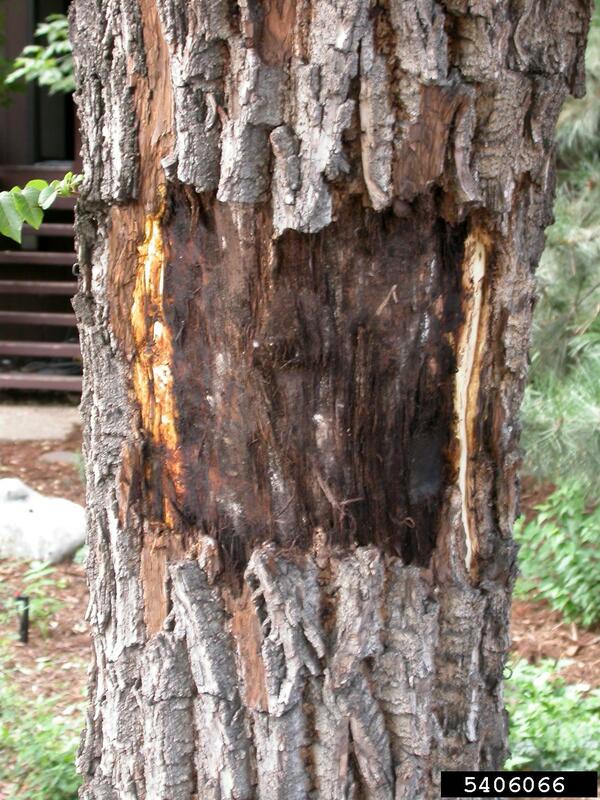 Image 3 – Symptoms of Thousand Cankers Disease (Geosmithia morbida – proposed name). 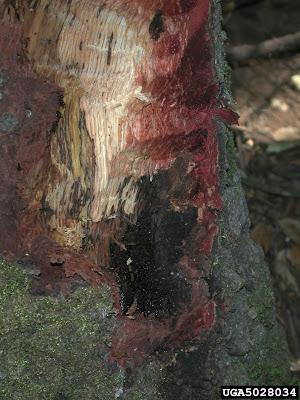 The image above is an example of large trunk cankers common in end stage infestations of cankers. Location: United States. Photo by Whiney Cranshaw, Colorado State University, Bugwood.org. Walnut is a high value species under threat from thousand cankers disease (TCD), an emerging insect-associated pathogen complex caused by an unknown exotic fungus that forms coalescing stem and branch cankers on black walnut. TCD is associated with the native walnut twig beetle. 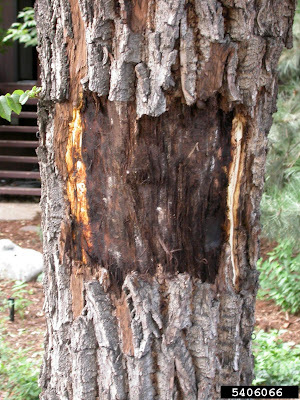 Initial reports of black walnut mortality occurred in western states in 2001, but retrospective reports of tree mortality throughout the 1990’s suggest that TCD may have been present in the west for over a decade. It has been reported in eight western US states and Mexico, and more recently in neighboring Tennessee. The full host range of the beetle vector and associated fungi is unknown and disease epidemiology is not fully understood. Though the walnut twig beetle is a western species, questions remain whether the associated fungus might be vectored by other beetles, either native or non-native, whether the western vector could establish in Appalachia, and the extent to which TCD might be transmitted via firewood and wood products. The susceptibility of other nut-producing trees, including closely related butternut and hickories, is unknown. Given the high value and geographic range of black walnut, and the prevalence of nut production throughout the eastern USA, our southeastern forests are clearly at risk from this emerging disease complex. The insect-pathogen complex associated with TCD threatens the persistence of black walnut, and perhaps butternut, in the southeast. 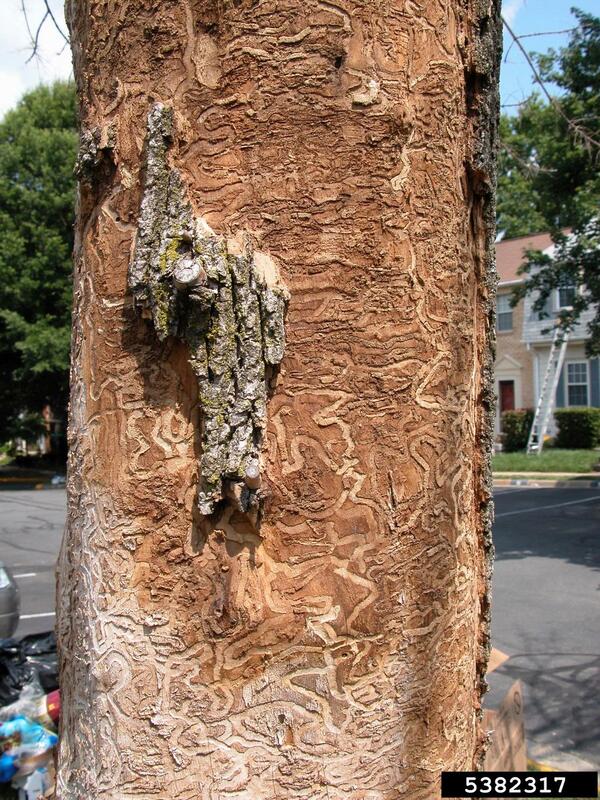 Image 4 – Symptoms of Emerald Ash Borer tunneling (Agrilus planipennis or Agrilus marcopoli). Ash are present throughout much of Appalachia, and are threatened by the exotic emerald ash borer (EAB). Since it was first reported in the USA in 2002, EAB has expanded its geographic range dramatically, causing extensive ash mortality and making headlines throughout the US. North American ash are especially susceptible, and EAB has proved capable of traveling great distances in association with movement of firewood, and to a lesser extent infested nursery stock. Although it has been present in Kentucky since mid 2009, EAB-induced ash mortality is not yet common. Urban forests will be particularly hard hit, and the ash component in Kentucky’s forests, particularly in the northern 1/3 of the state, is significant. EAB-induced ash mortality will reduce the ash available for commercial uses, including the handicraft industry, and markedly change the structure and composition of affected forests. Our goal in providing these examples is to generate an awareness of the potential impact of invasive species upon Central Appalachia’s handicraft industry. Despite financial support for this industry at both state and regional levels, such economically-driven efforts must be complimented with ecological education with regard to invasive species. Many culturally-based industries, beyond and in addition to handicraft production, such as small-scale agriculture, eco-agro tourism ventures, and preservation initiatives, rely on a stable ecological environment. Yet, non-native species threaten both environments and economies. It is our hope that this brief essay contributes to the continuing dialogue pertaining to alternative economic development and invasive species. We would like to thank Zeb Weese, Environmental Biologist Consultant, Kentucky Heritage Land Conservation Fund, for his assistance with this project. Barker, G. 1991. The Handcraft Revival in Southern Appalachia, 1930-1990. Knoxville: University of Tennessee Press. Blee, K. and Billings, D. The Road to Poverty: The Making of Wealth and Hardship in Appalachia. Cambridge: Cambridge University Press. Eller, R. 1982. Miners, Millhands, and Mountaineers: Industrialization of the Appalachian South. Knoxville: University of Tennessee Press. Eller, R. 2008. Uneven Ground: Appalachian Since 1945. Lexington: University Press of Kentucky. Fickey, A. 2011. The focus has to be on helping people make a living: Exploring Diverse Economies and Alternative Economic Spaces (includes review of literature pertaining to diverse economies research program and alternative economies). Geography Compass 5(5): 237-248. Fields, J. 2003. The Craft Heritage Trails of Western North Carolina. Asheville, NC: Handmade in America. Gibson-Graham, J.K. 1996. The end of capitalism (as we knew it): a feminist critique of political economy. Minneapolis: University of Minnesota. Gibson-Graham, J. K. 2008. Diverse economies: performative practices for ‘other worlds’ (includes extensive online bibliography). Progress in Human Geography 32 (5), pp. 613–632. Hill, S. 1997. 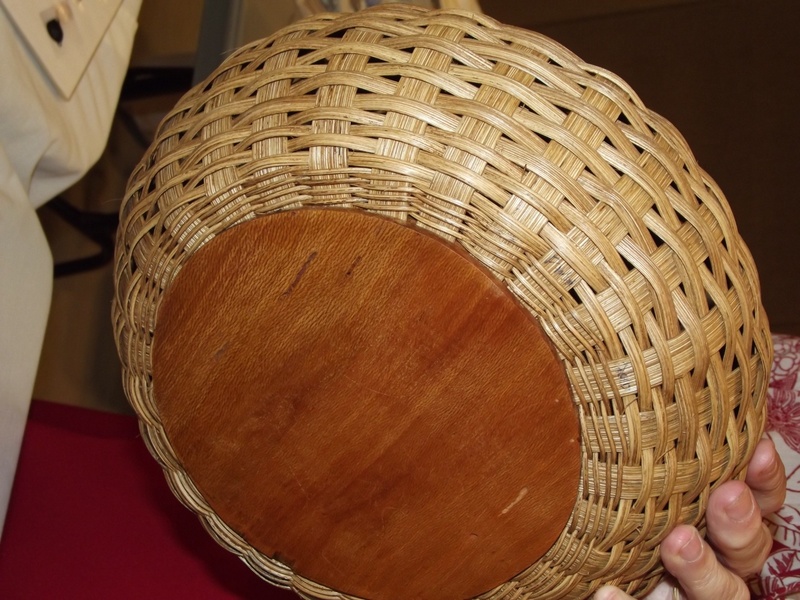 Weaving new worlds: Southeastern Cherokee women and their basketry. Chapel Hill: University of North Carolina Press. Lockwood, J. L., Hoopes, M. F., and Marchetti, M. P. 2007. Invasion Ecology. Malden and Oxford: Blackwell Publishing. Carnegie, M. 2008. Development prospects in Eastern Indonesia: learning from Oelua’s diverse economy. Asia Pacific Viewpoint 49(3): pp. 354–369. Fickey, A. 2011a. The focus has to be on helping people make a living: Exploring Diverse Economies and Alternative Economic Spaces. Geography Compass 5(5): pp. 237-248. ---. 2011b. The Messy and Complex Politics of Cultural Intervention. Journal of Appalachian Studies 16(1/2 – Spring/Fall 2010): pp. 115-118. Fuller, D. and Jonas, A. E. G., 2003. Alternative financial spaces. In: Leyshon, A., Lee, R. and Williams, C. C. (eds) Alternative Economic Spaces. London: Sage: pp. 55-73. Gibson-Graham, J. K. 1996. The end of capitalism (as we knew it): a feminist critique of political economy. Minneapolis: University of Minnesota Press. Gibson-Graham, J.K. 2006. A postcapitalist politics. Minneapolis: University of Minnesota Press. Leyshon, A., Lee, R. and Williams, C. C. (eds). 2003. Alternative economic spaces. London: Sage Publications. Leyshon, A., Lee, R. and Williams, C. C. (eds). 2003. Alternative Economic Spaces. London: Sage. Mencken, C. and Maggard, S. 1999. Informal economic activity in West Virginia. In: Keith, B. and Althouse, R. (eds) Inside West Virginia: public policy perspectives for the 21st century. Morgantown, WV: West Virginia University Press, pp. 87–106. Oberhauser, A. 2002. Relocating gender and rural economic strategies. Environment and Planning A; 34(7): pp. 1221–1237. ---. 2005. Scaling gender and diverse economies: perspectives from Appalachia and South Africa. Antipode 37 (4), pp. 863–874. Samers, M. 2005. The myopia of ‘‘diverse economies’’, or a critique of the ‘‘informal economy’’. Antipode 37 (4): pp. 875–886. Williams, J. 2002. Appalachia: A History. Chapel Hill: University of North Carolina Press.